Jet2.com is set to operate its biggest-ever ski season after announcing a 30 per cent capacity increase to its winter ski programme. The budget carrier, which was recently named Best Airline – UK and Best Low-Cost Airline – Europe in the inaugural TripAdvisor Travellers’ Choice awards for airlines, will now operate more than 60 weekly flights to seven top ski destinations: Andorra (Barcelona), Geneva, Grenoble, Lyon, Salzburg, Turin and Verona. In total, more than 330,000 seats are available to the best slopes in Europe, a 30 per cent capacity increase on last season. In response to skiers looking for weekend flights and short ski trips over a long weekend, the company has scheduled a choice of weekday and weekend flights, timed for those looking to shred the slopes over the weekend or over a short-break. The programme includes the airline’s first ski flights from its new bases at London Stansted and Birmingham, with up to 11 weekly ski flights to four ski destinations (Lyon, Grenoble, Geneva and Salzburg) from London Stansted, and seven weekly flights to four ski destinations – Grenoble, Geneva, Salzburg and Turin – from Birmingham. Belfast International – Reintroduction of ski flights: Weekly flights operating to Salzburg and Verona. Almost 9,000 ski seats available. Birmingham – New routes: Seven weekly flights including three to Geneva, two to Grenoble and one to Salzburg and Turin. Over 30,000 seats available. Edinburgh – two weekly flights to Geneva and weekly flights to Salzburg and Turin. Almost 20,000 seats available. East Midlands – up to five weekly services, with flights to Geneva and Salzburg. Over 20,000 seats available. Glasgow – one weekly flight to Grenoble and two weekly flights to Andorra (Barcelona). Over 17,000 seats available. Leeds Bradford – the largest ski operator out of Yorkshire offering a choice of 13 weekly flights – one to Grenoble and Salzburg, four to Andorra (Barcelona) and seven to Geneva. Over 60,000 seats available. London Stansted – New routes: Up to 11 weekly flights including five to Geneva, three to Salzburg, two to Lyon and one to Grenoble. Over 54,000 seats available. Manchester – Largest ski operator offering a choice of up to 20 weekly flights to six ski destinations. Programme includes up to SEVEN weekly flights to Geneva, four to Andorra (Barcelona), three to Grenoble and Salzburg, two to Turin and one to Lyon. Over 100,000 seats available. Newcastle – one weekly flight to Grenoble. Almost 5,000 seats available. Steve Heapy, CEO of Jet2.com and Jet2holidays, said: “We are delighted to be expanding our ski programme and offering customers more choice on our award-winning airline than ever before. People’s minds are turning to the slopes, as we have seen a jump in bookings in September that bodes well for the season ahead. 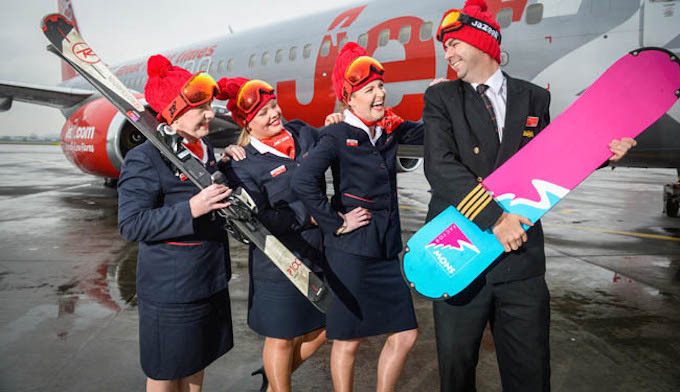 To launch the programme, Jet2.com is offering half price ski carriage on flights to Geneva, Grenoble, Salzburg, Turin and Lyon from all nine of its UK bases. The promotion to new bookings made until 12 October 2017, for travel between 30 November 2017 and 30 April 2018.